Already during recruiting processes measures for the absolutely non-discriminatory collaboration are applied at the institute and are improved constantly. Following the so-called Leibniz cascade model TROPOS also indents to increase the proportion of women, especially in post-doc and leading positions. Therefore, a stage-model was implemented in 2012, which was defined according to the current structure of employees at the institute. Particularly worth mentioning here is the appointment of Prof. Ina Tegen as head of the department “Modelling of atmospheric processes” in 2012, and the participation of two female scientists in the Leibniz Mentoring program for women. Two SAW-funded junior research groups are headed by women. and on 29 June 2015 after the re-auditing procedure. und am 29.06.2015 nach der Reauditierung. On 27 June 2018 TROPOS received the third certificate. A further prerequisite for equal opportunities is the compatibility of work and family life. Especially for young researchers this enables better conditions for career development. 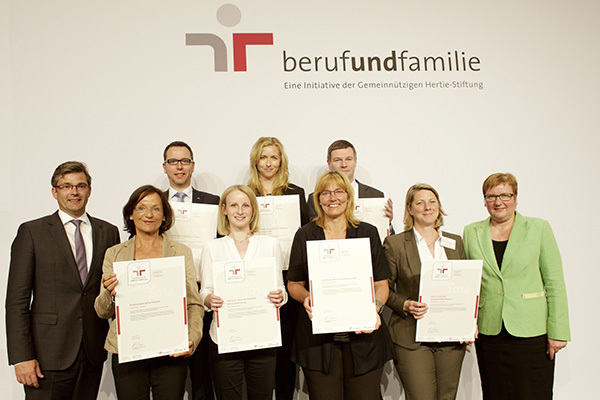 The certification of the "career and family" audit on May 25 in 2011 documents the institute's efforts internally and externally. Here the certificate has been officially handed over by the Parliamentary State Secretary at the German Federal Ministry of Economy and Technology, Peter Hinze in Berlin. The head of the TROPOS administration, Mrs. C. Peter received the certificate on behalf of the institute (picture 1). 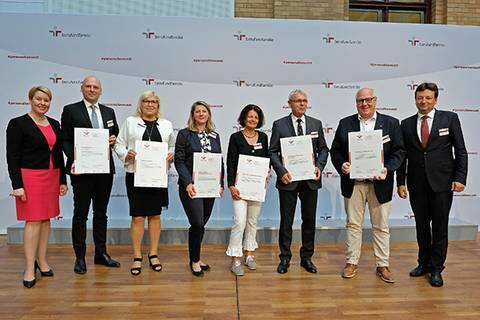 After three years working with the audit and after a re-auditing procedure TROPOS received the certificate for the second time on 29 June 2015 (picture 2). During the following consolidation process the institute continued to develop and practice family friendly measures according the target agreement of the audit and achieved the thirs certification on 27 June 2018 (picture 3). The auditing procedure of "career and family" evaluates completed and implemented measures suitable for families and shall create new ideas to improve the working conditions for parents or people caring for relatives. It is designed as a continuous process accompanied by a yearly report and a re-auditing procedure after three years to control the fulfilment of the designated target agreements. The successful certification proves that practising the existing regulations for flexible working times and part time work TROPOS has established good conditions for harmonizing work and family. The improvement of a familiy friendly general framework shall extend the international competitiveness to create a positive working environment and attract high qualified personnel. For higher job satisfaction and motivation of employees we see the improvement of working conditions as a necessary requirement. Since January 2011 TROPOS is a member of the Dual Career Network Central Germany, which supports spouses/partners in the Leipzig/Halle region. If there is a need the network aims on the integration of both partners in the region. On request the participating intitutions agree to invite qualified applicants from other member institutions for job interviews according their vacancies. 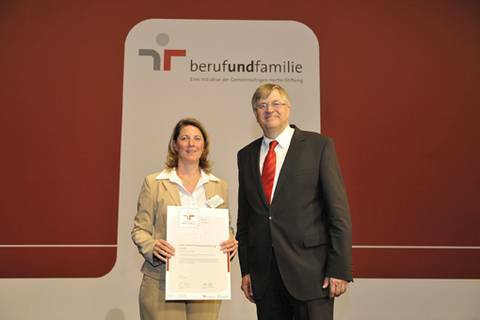 Together with 100 other partners TROPOS is part of the action plan "Children and family friendly Leipzig". With the signature the partners are obliged to further promote family friendly conditions in Leipzig.